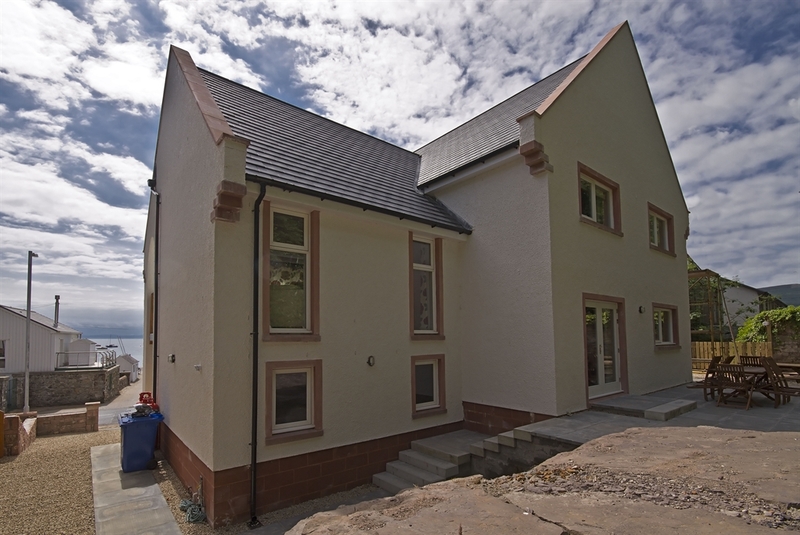 Luxury self catering 4 bedroom holiday house in the centre of Lamlash with fabulous views over to Holy Island. 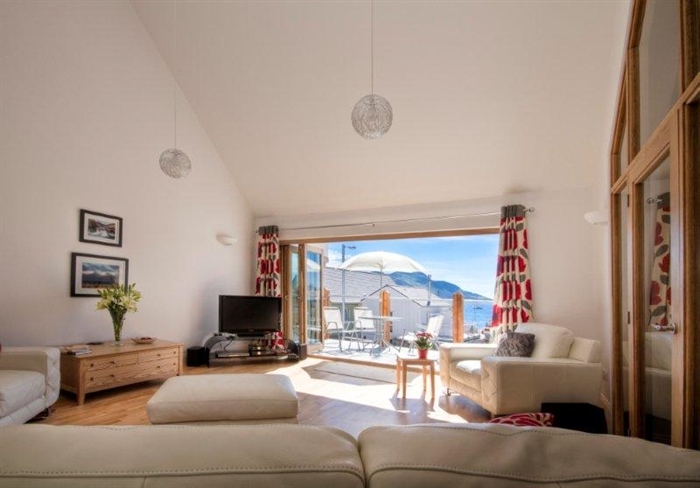 It is fabulously located in the centre of the village of Lamlash on an elevated site, directly opposite the pier, where you can watch or join in with the boats and sailing activity. The accommodation is contemporary and stylish with high quality furnishings and decor. It features solid oak wood floors with under-floor heating, carpets in the halls and bedrooms; and ceramic tiled floors in the bathrooms. 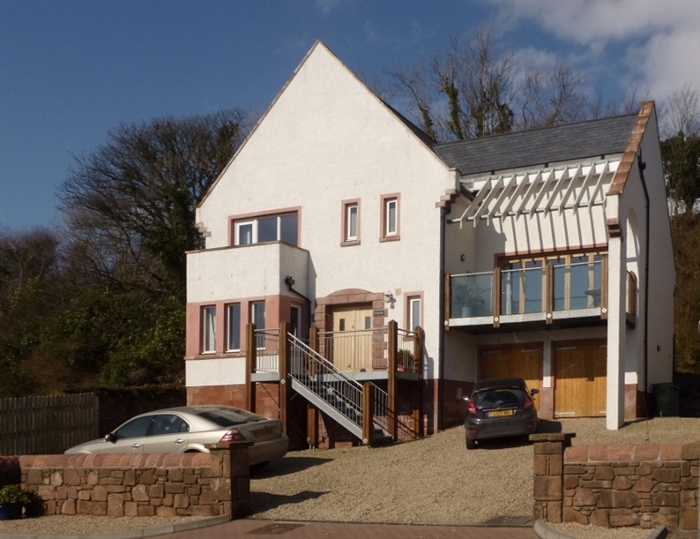 There is a spacious open plan kitchen/dining room, a separate living room with 37" LCD TV, DVD Player, CD/Radio HiFi, leather seating and large elevated balcony enjoying open views over Lamlash Bay. 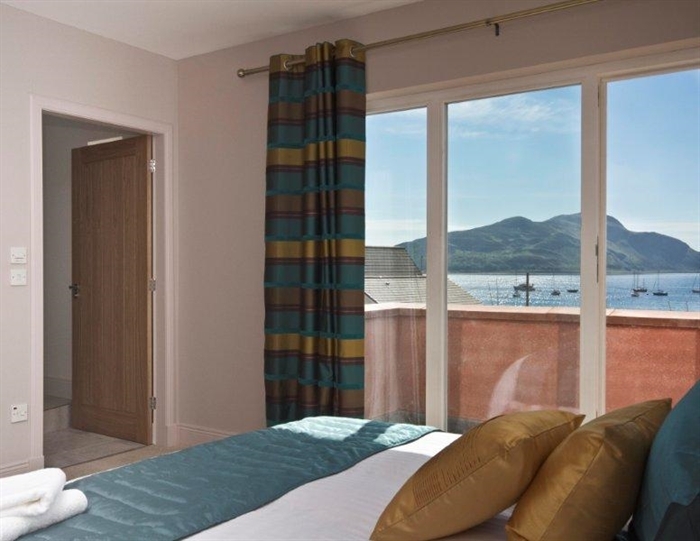 Patio doors in the dining room lead to an open spacious patio with table and chairs and again to enjoy the wonderful views of Lamlash Bay and the wild flower gardens at the rear. The property would be ideal for two families with two double bedrooms (both en-suite) and two twin bedrooms, together with a family bathroom. Outside there is plenty of private parking space with paving around the property and outside seating. Stairs to front door Ground Floor Entrance vestibule leading to spacious hallway with cloakroom and wc. Laundry Room with automatic washing machine and condenser tumble dryer. Side access to kitchen and patio doors from dining area to rear. 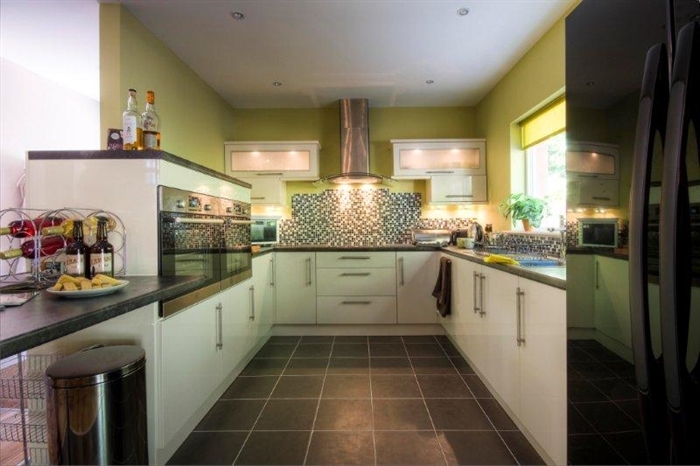 Kitchen/Diner with a range of cream gloss units, 2 built-in ovens and ceramic hob, dishwasher, American style fridge & freezer, microwave. Dining area with table & chairs for 8 people. Double bedroom with built-in wardrobe. 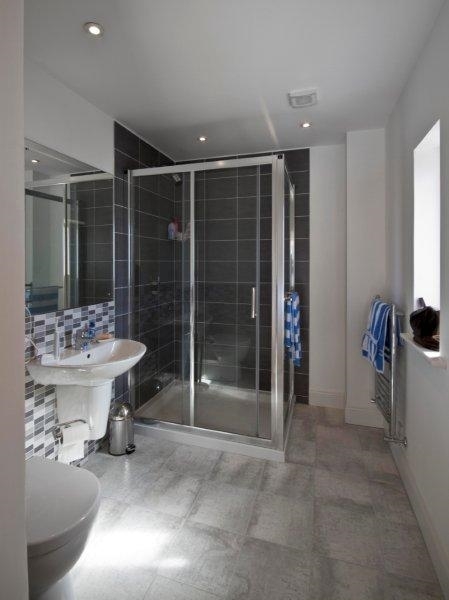 En-suite facilities with enclosed shower cubicle.Steps to living room Living room with cream leather seating and LCD TV. Patio doors leading to balcony area with outside seating. Sea views over Lamlash Bay. Steps to upper floor Study area with desk. Master bedroom with king-size bed, built-in wardrobe and en-suite facilities with double shower enclosure. 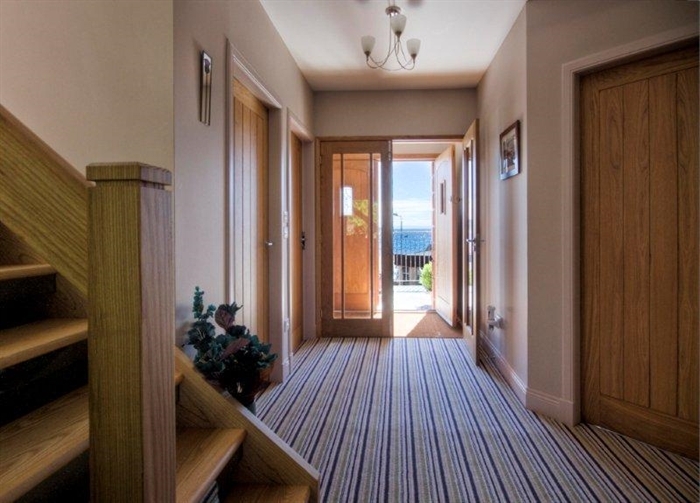 Patio doors to enclosed balcony with sea views. 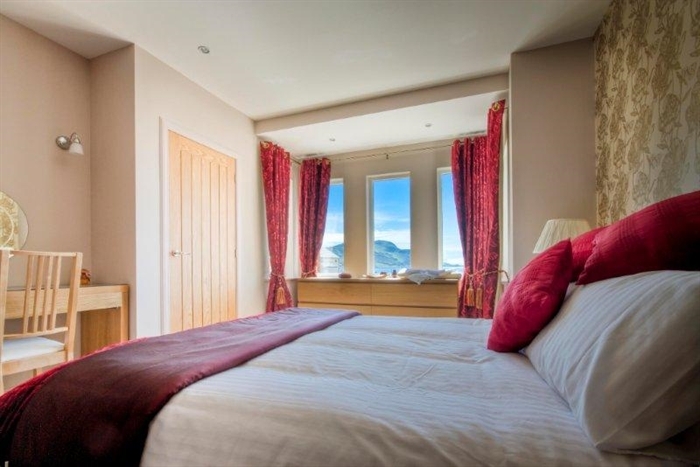 2 x Twin bedroom with 2 single beds in each room, built-in wardrobes and dressing tables. Family bathroom with double-ended bath, sink, wc and heated towel rail. Outside Paving around property. Private parking. Opposite the house, there is a safe sandy beach and a small play park for young children. There are forestry walks and cycle paths nearby and also the challenge of hiking to the summit of Goat Fell with its magnificent views over the whole of Scotland on clear days. Lamlash Bay is a beautiful sheltered bay with a local yachting club. There are powerboat and sea kayaking trips available, so you can explore the bay at your own pace. You can also catch the ferry to Holy Isle and enjoy a picnic lunch. If you enjoy golf, there is a 18-hole course nearby, with a friendly clubhouse open to non-members and further 6 golf courses around the island including the famous Shiskine Golf Club, located on the west coast. Local wildlife include basking sharks, seals (often seen basking on rocks just offshore), otters, porpoises and a variety of sea birds. 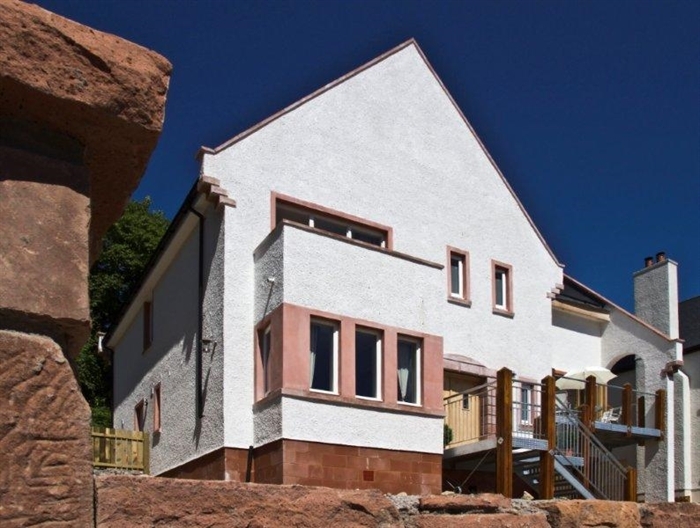 You can enhance your break with spa and beauty treatments, available at the nearby Auchrannie Resort in Brodick; a visit to the National Trust Brodick Castle and Country Park and the Isle of Arran Distillery at Lochranza. Arran is well known for its local produce, including speciality cheeses, oatcakes, chocolate, ice cream, mustards and whisky, including "Arran Gold", so you can stock up your holiday home with delicious food. Linen and towels included (please bring your own beach and swim towels). Electricity included. 37" LCD TV, DVD Player, CD/Radio HiFi, 2 built-in ovens and ceramic hob, dishwasher, American-style fridge & freezer, microwave, automatic washing machine and condenser tumble dryer. Highchair and travel cot available. Please advise your requirements at the time of booking. Garden furniture including BBQ.